Hello all in the ‘cloud!’ My goals for this blog are as yet undefined. However, it will become more clear as the days roll forward. In essence I hope to present my ideas, investigations, and work to a wider audience. The revolution in digital media, especially for the humanities, has come as a shock to many. Thus secondarily this blog is an attempt to work out in my own mind how best to present historical information to a diverse audience. Blogs are more than public history in digital form, it is a new forum creating new forms of dialogue between academics and the public. Visit Dan Cohen’s Digital Humanities Blog for more information on the digital revolution in the humanities. 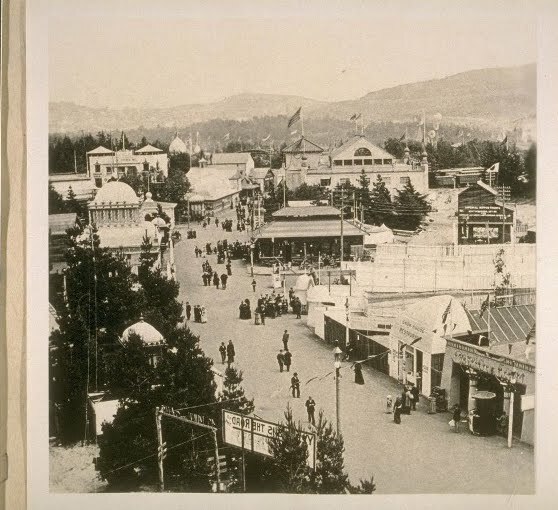 In 1894 San Francisco hosted a Mid-Winter Fair. A huge celebration and historical continuation of the California Exhibit at the World’s Fair in Chicago (1893). Apart from this, the Mid-Winter Fair was a grand structured set of displays and cultural discourses of historical pageantry and emerging regional urban identity. One thing this event demonstrated, was that these displays revealed not only collective historical memories but also presented a shared future. In other words, visions of how San Francisco and the region were developing into a Pacific Metropolis were dominant. The Mid-Winter Fair therefore, represented an elaborate venue for dialogue between class, ethnicity and individual identities, structuring a distinct societal identity orientated in time. To many commercial-civic elite, the corollary for the apex of civilization could be seen in classical examples of Rome and Greece. In the 1890s, the California Pioneer Myth, the city’s producer ethic, and San Francisco’s regional dominance as the urban metropolis inspired many to identify their society with Ancient Greece. But of course these memories of ancient history were highly selective and subjective. Late nineteenth-century understandings of Roman and Greek culture in the American West were tinged by contemporary perspectives of what liberty, democracy, and society meant. Throughout the headlines of The San Francisco Call and San Francisco Chronicle in 1897, any reference to classicism comes through the Greeks. Key tenants of individualism, democracy, and libertywere important to Californians and particularly of the commercial-civic elite of San Francisco. This idea of San Francisco being a continuation of the Greek democratic experience was expressed most eloquently by James D. Phelan, mayor of San Francisco from 1897-1902. In an address given at the opening of the Mechanics’ Institute Fair in 1896 titled, “The New San Francisco,” Phelan expressed the perfection of Greek concepts on the western shores of the American nation. But as we all know, the next question to ask is quo bono? – who benefits from this perspective of urban identity as a progression of the Ancient Greek model of governance? Who is included as citizens? Who is silenced? Contradictions in various visions of San Francisco’s past and future revealed the complexity in perceiving how individuals and groups understood their city. What does it mean for individual and group identity to orient themselves within the past, present, and future of an established narrative identity? For ourselves (Bay Area and California residents) can we ask similar questions? How far have we come from this regional identity of the Bay and our state in the 1890s? How do we define place now in the 21st century? And where are we going in this place? Identity is more than place specific however, and as I hope to investigate, an identities orientation in time is just as crucial. To Californians, and many Americans at the time, the United States was at the vanguard of societal development – at the edge of discovery. At no time in history many thought, had a society bucked the trends of what destroyed the Romans, the Greeks, and all the ancient civilizations of the past. Only in America had economic, demographic, and settlement growth disestablished the tenants of societal growth. Thomas Malthus, many Americans understood, was right in that natural resources limited human population growth. But in America, providence, manifest destiny, and technological innovation presented a very different picture of human societies. This of course is the heart of American Exceptionalism. However its ideological impacts nationally, regionally, and locally demonstrated the variety of interpretations that could emerged from this shared national tenant. How then are we to understand a city’s collective understanding of itself in such a complex historical process as identity creation? The key is expressive culture. How individuals, groups, and the socially powerful present themselves to the public locally, regionally, and nationally, reveals glimpses of the respective identity. Like Phelan’s speech extolling San Francisco’s virtues as an ordered and progressive society, evaluating how individuals, groups, and social elites present themselves reveals how among other things, social power presents, structures, and orders a vision of the city for others to reconcile. This blog will be constructed to answer many of the questions asked above. Soon to come will be a click-able network of links to structure and connect historical terms, ideas, and conclusions. These updates will allow a visitor to more fully understand what I am writing about at any given time, but also eventually provide a model for presenting historical information in a wiki-like format. Any comments and suggestion to this end will be greatly appreciated, as this is a constantly evolving project. For an overview of this project check out the “Introduction” in the navigation menu above. For a ever changing list of historiography, check out the menu of the same title above. Additionally, if you are interested in a particular component of this project (regional identity or historical pageantry for example) check out the “Categories” list on the side-bar. Or for the traditionalists, check out the “Tag Cloud” to browse topics by keyword. You are currently browsing entries tagged with Pioneer Myth at Gilded Empire.